Ah, Monday, I missed you, now let’s get down to business. Either you’ve written Chase so well, that I feel bad for him for being socked. Or he’s so mentally deficient, its like tony’s hitting a baby, and I feel bad for him. Le gasp! Somebody actually saw Tony’s eyes?! That’s incredible! Does Tony have a third eye like Marek? haha maybe. wonder if Hanna, too, fell in love with Marek’s eyes? and lolol “best two seconds of my life” poor girl. i wonder if she ever ever sees his eyes any other time? Another moment when he opens his eyes, huh? And thus I raise another question: what is Tony’s “in bed” face? O know a grind/crust festival where they do these kind of business, but even cooler adding a mad max look to the bikes. Now I simply must see his eyes. I was never that interested in them until now… Tony looks good with the mustache though. If you squint your eyes he’s wearing it. http://www.youtube.com/watch?v=K7l5ZeVVoCA&ob=av3el That popped into my head on the last panel. I do not know what is more disturbing. That the moustache is made of back-hair, or that it is actually dapper. How can you fight with someone trying to give you a mustache? Mustaches are the coolest. Are we forgetting that MONTY IS MISSING???? And where in blazes has Snarky run off to? I thought she has before…? 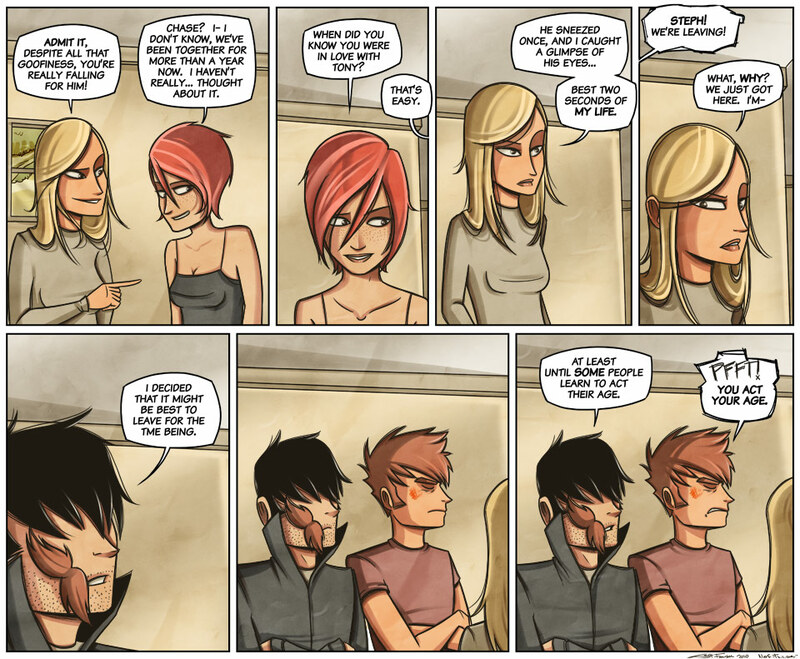 Taryn’s face in the first panel is just so effin’ adorable!